In this tutorial, we'll look at properties containing geometric data in the prims we produced in the previous Hello World! example. The starting layer for this exercise is at extras/usd/tutorials/authoringProperties/HelloWorld.usda. This tutorial is available in extras/usd/tutorials/authoringProperties/authorProperties.py. You can follow along with this script in Python. List the available property names on each of your prims. Read the extent attribute on the sphere prim. This returns a two-by-three array containing the endpoints of the sphere's axis-aligned, object-space extent, as expected for the fallback value of this attribute, (i.e. no authored opinion in the scene description), given that the fallback radius for the sphere is 1.0. Calling Get() on the attribute with no arguments gives you the value for the attribute at the Default time. Attributes can also have time samples authored on them; for example on the points attribute of a UsdGeom.Mesh, in a pose cache (animation bake) exported from an animation package. (See the End to End Example for a mock-up of this pipeline in action). GetPropertyNames() is instructive for demonstrating that we can find and fetch properties by name. In practice, when one needs to iterate over a prim's properties, it is generally more convenient to use one of the flavors of GetProperties() or GetAttributes() or GetRelationships(), which return UsdProperty, UsdAttribute, and UsdRelationship properties upon which one can directly operate. Set the sphere's radius to 2. Because there is no magic recomputing the sphere's extent as a result (part of the reason why), we must also update it to reflect the sphere's new size. Author a displayColor on the sphere. As with Hello World Redux - Using Generic Prims, we can do so using the UsdGeom API rather than using the raw attribute name. Note how the (tab-completable) API abstracts that the attribute under the hood is actually namespaced as "primvars:displayColor", which is not something that an authoring client should need to know. Here is the expected result in usdview. 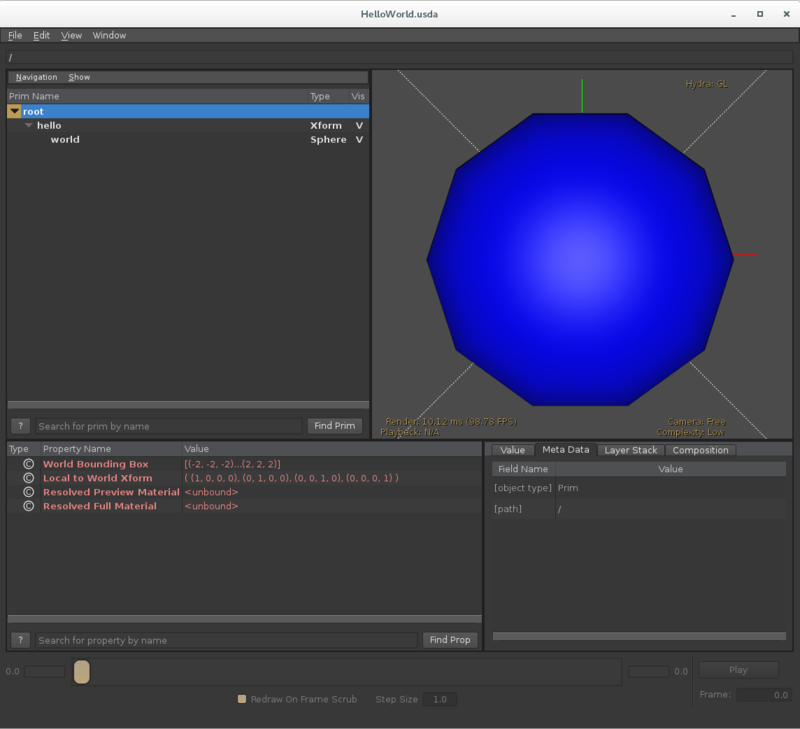 Note that the camera automatically frames the geometry, but we can see that it is larger than the sphere from the last tutorial by inspecting its attributes in the Attribute browser. UsdRelationship refines UsdProperty with API to target other prims and properties, and resolve those targets robustly, and through chains of relationships.